Who is the TESOL Minor or TESOL Certificate for? Are you interested in other cultures? Would you like to teach? Are you interested in languages? Are you interested in living overseas? Or, does the idea of working with new arrivals to the United States sound exciting? If the answer to any of these questions is yes, then you should consider minoring in TESOL or completing the TESOL certificate. You don’t need to already know a language other than English, or to be good at learning languages, to minor in TESOL or to complete the TESOL certificate. 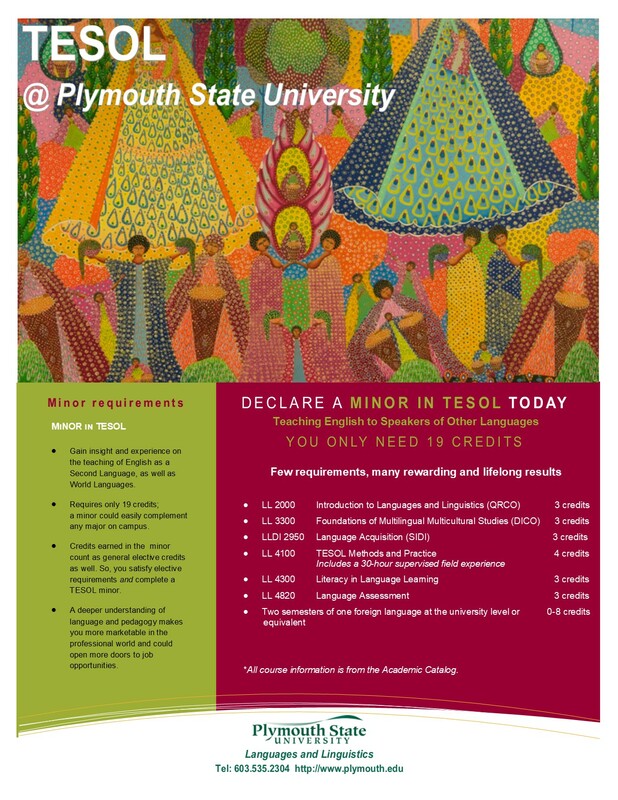 At Plymouth there are two ways for undergraduates to study TESOL, the TESOL Minor or the TESOL Certificate. What’s the difference between the TESOL Minor and the TESOL Certificate? The TESOL Minor is 6 classes (19 credits) plus two semesters of a foreign language. To minor in TESOL you must be completing a teacher certification in your major. Students who minor in TESOL will get the New Hampshire Department of Education TESOL K-12 teaching license/endorsement. TE 4100 requires a 30-hour field experience. *All course information is from the 2017-2018 Catalog. The TESOL Certificate is 5 classes (16 credits). 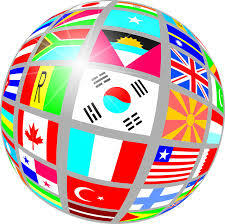 For the certificate you do not need to complete two semesters of a foreign language. The certificate in TESOL is open to any undergraduate major, and certificate credits may be applied to any undergraduate degree program. 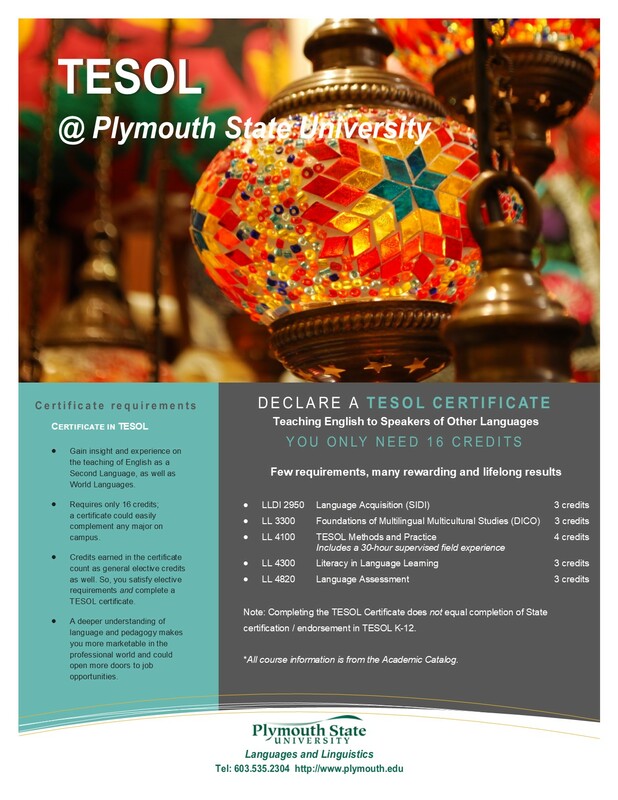 The TESOL Certificate does not lead to the New Hampshire Department of Education TESOL K-12 teaching license/endorsement. There is a growing need for teachers and para-educators trained in working with students who don’t speak English. The TESOL Certificate and the TESOL Minor train prospective teachers to meet this growing demand for ELL teaching positions in the United States and overseas. All classes are taught by professors who are trained, licensed and experienced English language teachers themselves. The TESOL minor includes three General Education courses, TEDI 2950 Language Acquisition (Scientific Inquiry Direction), TE 3300 Foundations of Multilingual Multicultural Studies (Diversity Connection), and TE 2000 Introduction to Language and Linguistics (Quantitative Reasoning, for some majors). The TESOL certificate includes two General Education courses, TEDI 2950 Language Acquisition (Scientific Inquiry Direction), and TE 3300 Foundations of Multilingual Multicultural Studies (Diversity Connection). Visit the Online Learning page for more information. Visit the College of Graduate Studies M.Ed. in TESOL page. Read through the TESOL Informational Brochure to find out why you should study TESOL at the graduate level. Find Plymouth TESOL on Facebook. Other questions about TESOL at Plymouth?